Results from Baccarat Simulations Series 29 are presented below. In this series, I examined R setups. 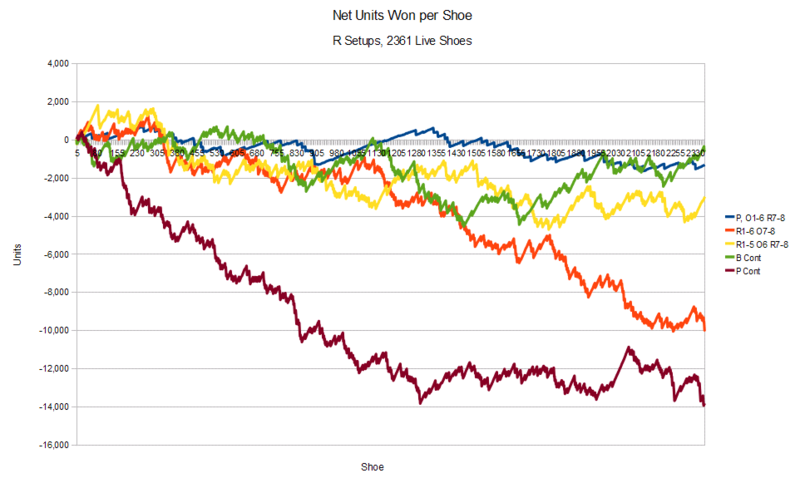 Data Set: 2361 live baccarat shoes manually recorded from land casino tables (ref. My Baccarat Shoe Factory). This entry was posted on February 24, 2011 at 11:12 am and is filed under Life with tags analysis, B, baccarat, baccarat simulations, baccarat simulator, banker, bet, bet progression, data, disparity, flat betting, land casino, live baccarat shoes, method, money, money management, player, program, programming, R setups, RAPB, results, setup, shoe, strategy, system, testing, threshold, trigger. You can follow any responses to this entry through the RSS 2.0 feed. You can leave a response, or trackback from your own site.